There is so much for me to love in this list. The thing that made me most happy – the return of turquoise! Individualism is great, I love that retail is providing variety. Midi’s and great dresses, are so welcome. Rompers and jumpsuits are definitely winners for me, as is playful suiting. I have never bought into leggings except as gear, so the return of jeans and denim is most welcome for me. Thank you for breaking it down I’m exhausted just looking at this-but glad there will be lots of options! What I’m hoping most to see is dressy work appropriate things in warm colors, lace, and blendy prints. Angie – wow thank you for wading through this. I’m exhausted reading it, I can’t imagine watching all of the shows and trying to distill them. The good news – long jackets should still be trending, I will remain vigilant. What I’ve noticed at retail is that the Balmain double breasted cutaway is starting to be duplicated – VB most notable but even the Boden jacket that you posted the pink was riffing on that silhouette. Cutaway styling is extremely flattering and versatile for me as it works for dresses and pants. I’ll be looking for a jacket/jackets in that style. Wow, what a lot of information! I really like the flowy skirts and return of warm tones. Outfit juxtaposition is fun and I like prints. I am also happy that all sorts of footwear is being shown. I hate to spend large parts of my wardrobe on shoes to only have them feel dated the next year. Now I am off to study this some more! A lot to digest here! A potpourri of styles for sure. It will be interesting to see what shows up in the stores (hopefully not all beige!). Yikes. Chaos indeed ! I am happy about turquoise and suits in merry colours. Can you say more about why a high-rise pant is hard to wear if you’re short-waisted? Oh. My. Goodness… thank you SO much for taking the time to make sense of all the chaos! Many thanks for sharing your thorough assessment with us, Angie. What a lot to pull together! Here’s hoping that longer dresses and numerous footwear possibilities remain accessible indefinitely. Individual choice across silhouettes and degree of minimalism makes for a more interesting day all around. As to chaos, well, I’ll be opting out of it on the fashion front. Sometimes can’t help engaging with it elsewhere. Thank you for all the work you do with this, Angie. I have done my one little summary and it was interesting to see how close I got to your interpretation -quite well, I’d say. One trend I also noticed, which may be hidden within others you describe- is lots of bohemian, California -inspired styles: tie-dye, crochet, macrame, fringe, surf-inspired styles etc. This is one of rare seasons when I have seen more that I dislike than I like, which is perfect to put into practice a season with focus on shopping my closet and little actual shopping, with focus on small number of higher quality/contemporary pieces, some of which are essentials (I need at least three cropped structured blazers that work well with dresses). What I like and will continue to wear are individualism, maximalism, (my way), patterns (single or mixed), structure, waist definition, midis, high rises, suits, wide cropped pants, block heels, some irregular juxtaposition, cooler shades of red/pink, some 80s and 90s styles. I will more-less completely stay away from beige and all the warm colors you mention (other than little accents), acid wash, denim-on-denim, shorts, jumpsuits, and oversized styles. 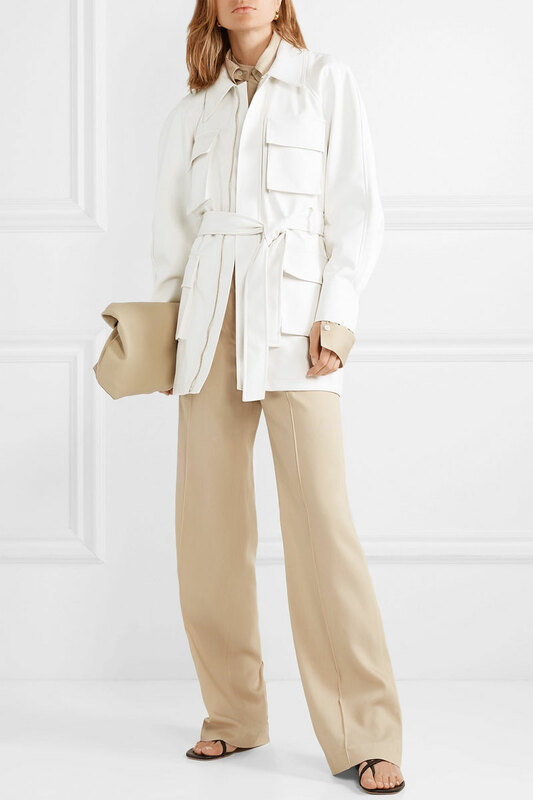 When it comes to utility I will wear the couple of olive pieces I have, and the only new piece I would be interested in adding is a dressier white utility jacket if I find it. I’s also like to add a few turquoise and cooler bright green pieces; as well as a full length wider pant in a light neutral. I won’t be particularly looking for any of these. What I am really excited are (playful) pantsuits, but not the shorts versions I have seen an overload of on the runway. I will be on the lookout for two styles, both colored (would love a light-to-mid blue) and in a light neutral. And finally, a couple of more spring lilac pieces to round up my capsule would be nice, as well as a new light colored neutral trench. So overall, my shopping plan/wish is: a couple of cropped jackets for dresses, a light trench, two pantsuits, some lilac, and a couple of more midi dresses and block heel pumps for work. There is also a plaid skirt-suit Ia m in love with and will be stalking, as it is super trendy and super pricey, and would only be purchased if found on significant discount. Love the turquoise, but have enough from last time I could find it to start the season. I was bummed by the new Kate Spade, 70s isn’t in my style goals. Any suggestions for who has dressmaker details? That is one comprehensive summary .Thank you so much for putting the time in and providing us with this,it’s a great read and very interesting to get a heads up on the season ahead and I already know that I WONT be doing cycling shorts,except on a bike! Hooray for the return of turquoise, one of my favorite summer shades! That all sounds overwhelming, but my main takeaway from all this is to keep honing my individual style. If trends are becoming less meaningful, all the more reason to follow your heart and go with styles that work for the individual. Of course keeping an eye on what’s new helps to stay current, but as someone who wants less wardrobe churn and more emphasis on my own personal style, it makes me happy that fashion seems to be becoming more about finding the designers and styles that connect with you personally, rather than all the designers jumping on the same bandwagon each season. I really admire your ability to put together such detailed yet readable reviews of a new season . A lot of work goes into this, and it shows! As usual, there are a lot of options , and the interesting part will be seeing what is prevalent at the mass market level. I can take or leave equal parts here and am happy that Sporty Luxe is moving on as the successor to Athleisure. This is my look . And just an aside on the footwear issue: just this morning, Alyson W featured a woman wearing extended snip-toe Pradas, which were original/vintage and caught my eye . Mind you , she is gorgeously artistic and stylish….and reminded me of the pair of snip-toe navy Prada pumps I finally got rid of (I cherished those things and babied them ) as that toe just looked wrong. I suspect that out here in the frozen Canadian wasteland, they wouldn’t have that same fashion-forward appeal anymore. WOW! What a lot of work but I appreciate this post so much. I will be coming back to this post again and again. I am excited about turquoise, coral and the reds and even beige as I have some replacing of light neutrals to attend to. I am also excited about midi dresses. What will I try that is new to me? 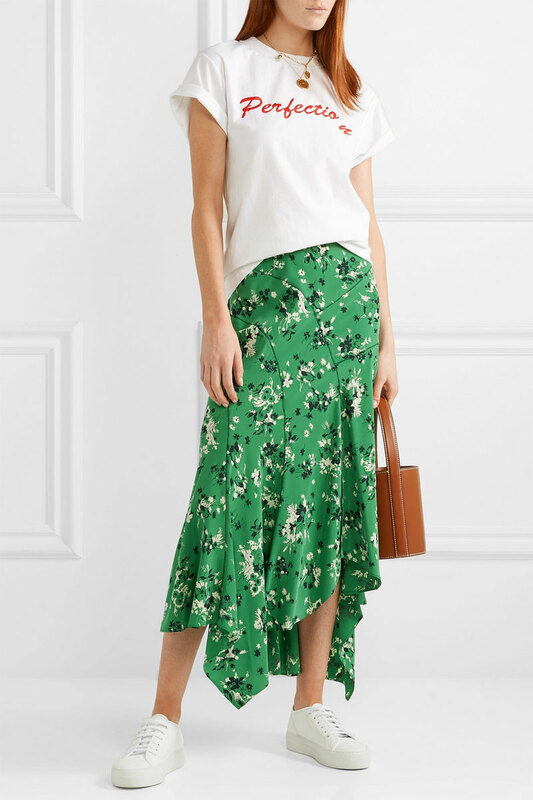 I would like some summer pleated skirts, a bright pants suit, wearing sneakers with frocks, including chunky ones, wearing turquoise with lime and apple green rather than mint. Are the bright neon colors of the 80’s returning? I kind of miss them for summer. A little bit of everything and something for everyone! Thank you for this inspiring and fun list – there are so many shows it must be hard to keep the mind from boggling. The pants suit trend has sparked my interest, and I am on board for beige and turquoise – which I would try together. As a big fan of individual style, I will have fun throwing in some vintage 80s and 90s pieces into the mix too. Thanks so much for the low down. I am really excited about neon, greens, lace, midis, turquoise, the shoe style free for all, wide legs & continuing jumpsuits. I can take what I like from it. Midi length, turquoise, flat shoes. I’d love to find a wider length pant for spring. Thanks for the summary! I will have to lean on my personal style a lot to make the most of the upcoming trends (or give them a miss) … but happy about turquoise, the range of cool reds/pinks/berries, and I’ll have a lot of fun looking at the 90s influenced stuff. WOW. This is one really nice blog post. There so much information distilled into a single post, it literally blows my mind how hard you must have worked on it. So much to digest! I am continually amazed at how you can pull approachable trends from the runway shows and translate that into something we might wear. The late ‘80s and early ‘90s were high school and college for me, and I passed on many of those trends then, so not sure I will adopt them now. I’ll be focusing on individualism (especially the variety in shoes,) adding corals, turquoise, and lime green, wearing the midis I already own, waist definition, and hope the variety of patterns translates to retail. I’d love to add some patterns, but am super picky about which ones I’ll wear. I’ve also been considering a pair of cargo pants, for a casual look other than jeans, so am glad to see that trending as well. It’s pleasure, ladies. Glad you liked the post. Bijou. I’m into turquoise, midis and jeans with you. Suntiger, good chance you’ll get what you’re asking for. Gryffin YES. The cut-away detail on the blazer is a fab ‘80s influence. RobinF, just about any shoe is going work. 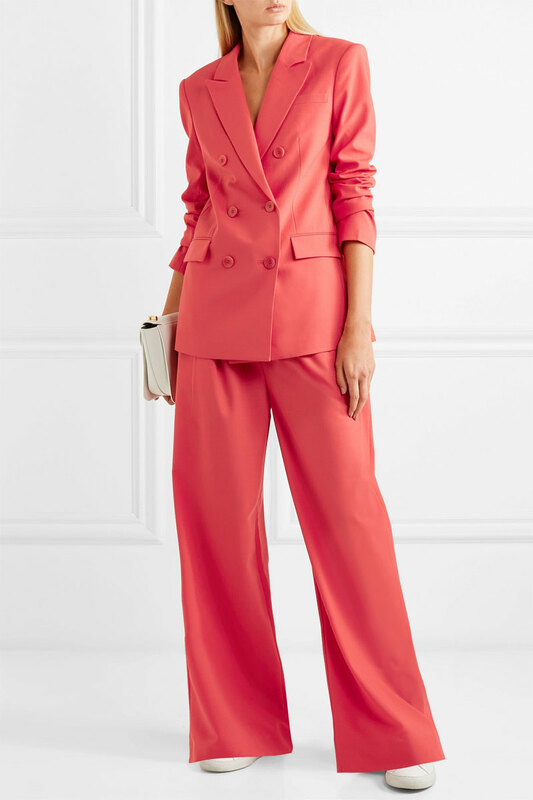 Sisi, are we going to get a pant suit in a fun colour this year? I have a burgundy pinstripe for Winter. Now I want a Summer suit in a bright. April, when you tuck a top into a high waist and you’re short in the waist – your waist looks even shorter. It’s generally a proportion that short waisted people do not enjoy showcasing, especially with a larger bust and shorter neck. But if you wear a top untucked over a high waist, you can’t see the waistband, so that’s an option for those who like it. Hope that makes sense. Nemosmum, I can see shades of tan look fab on you, and just about any shade of green. Eliza, wise words as always. We have to find our stylish peace. Tanya, good to see you participate. Miss you. YES, it’s a surfer look you’re describing. Not so big on the runways, and I see it as a junior trend at best. The bohemian “Johnny Was” look is alive and kicking! Kind of part of the ‘90s vibe and of course, borrowed from the ‘70s. Your shopping strategy sounds focused and fab as always. Janet, I nodded along to every word. You’ve got it! Lisa P, I appreciate your appreciation. It was a lot of work, but I enjoyed it, and it’s my job. We’ve reaching a stage where almost all footwear looks right. But most importantly, it has to look right TO YOU, and that’s where the personal part comes in – again! Joy, yay for turquoise, lime green and coral. And I love them together. I hope we see some neon too. Shevia, YES to, “A little bit of everything and something for everyone!” That’s dead right. delurked and Torontogirl, there you go. That’s the way to do it. Sterling, thank you. It took weeks to work through the shows, formulate my opinions, and prep the post. I’m glad it’s done! Kathie, the more shows you watch, the easier it is to identify the main themes. Your style strategy sounds fab. Enjoy it. Fascinating post. Except for beige, the colors sound great! And utility combines my birding outfits with everything else. Interesting.. Thanks for all the work, Angie. Thanks for getting us sorted for spring/summer, Angie. Your efforts are much appreciated. There is a lot to digest here. I’ve been seeing some green trickling in lately. It looks very fresh and I’m excited about it. Also excited to see what happens with turquoise. It’s been very long time since I’ve worn it but it was a colour that flattered me. And, keep the red coming! It’s my favourite non-neutral to wear. Thank you very much, Angie, for this wonderful post. The current state of fashion feels a little bit overwhelming and you have brought calm and structure into the seemingly chaotic state. Reading your post, I feel joy to try new things. Fun and interest. Yay to individualism and the personal in personal style. And roomy full length pants. I adore your roundup, Angie. I can get behind a lot of these trends. I wish I would see more maximalism out and about. I’m crazy about the earth tones staying strong in the warmer months. High waists are not for me, but if I find a style of pants I have to have, I’ve taken to adding an extra triangle of fabric to the waistband so they fit. I wasn’t a fan of acid wash the first time around, but I would consider it if it were over-dyed a different color, I just may do that on my own. I’m looking forward to seeing how this all plays out in the real world. Lots of fun and count me, too, on Team Turquoise! Also because it means, can my beloved teal be far behind? Glad to hear crops are still a thing, since I really doubled down and just about all my pants are high-waters. Thank you for the interesting analysis. I will happily wear: relaxed gilets, bias-cut skirts, bootcuts, wide pants with flats, square toes, round toes, ballet flats, round eyewear, midi dresses and skirts, trouser suits in fun colours, icy pink, watermelon red, berry tones, turquoise and bright green. I always look forward to your report on the spring trends. You have a way of getting to the core of what’s being offered. I like that there are a variety of styles so that we have choices. Some of my favorites are lower heeled shoes, midi length skirts and dresses, utility themed clothes like the jacket shown above, and pattern. Fab trend report, as always! I’ll definitely have to come back and study some more. I only had time to go through the ALC line…and saw some pieces that looked like things I had in the ’80’s. And one dress in particular had your name written all over it! Thanks for all your hard work and info . Sounds like I won’t do a bunch of shopping this spring and summer. Midi is length I enjoy, so there is hope ! Wow, Angie — such a lot of work you put into this! I value your interpretations. You take such a mish mash and make such good sense of it! I feel empowered now to pick and choose and figure out which trends will work for me. Off the top of my head — midis (yay! ), bias cuts (so pretty and elegant! ), bright suits (that sounds like so much fun), turquoise accents (fun with blue and silver, no? ), tailoring, relaxed gilets, higher rises, and all the footwear variety you can throw at me! Angie, this post is so fun and informative. I am laughing at your comment in the opening, describing the odd array of looks: “Through the chaos of over-the-top outfits, unrelatable looks, kitchen-sink combinations, messy hair, scary make-up, and very ugly outfits, an interesting and cohesive set of fashion themes emerged.” It amazes me each season that you can actually pierce through the overwhelming assortment of styles to discern actual trends. It’s beyond me how you do it, but I am grateful. Just a couple of days ago, I picked out my work “uniform” for the upcoming season, from what we have received so far. There are some pretty new things for me, including the basic outfit I’ll be working around, which is a pair of drapey viscose pants and a matching top that feels–and I think even looks–a lot like pajamas. They are a deep purple shade called iris–kind of bold for me! And I got a light orange sweater and an avocado green pullover to go with the purple! I’ll show it on the forum. Yes, Angie, that makes total sense — thank you. Since I never tuck in, I’ll keep wearing my high waists on my short waist. Thank you for sorting through the shows on our behalf! I love the idea of individualism, maximalism, pattern, 80s redux, acid wash, midis, denim, utility, earth tones and turquoise. Very curious to see what will filter down to retail! The boiler suit sorta has my attention. What a lot of options tho! You have stamina to go through all the collections! I’m so impressed and grateful. I’ll have to have a look at Dries. I love Dries. It seems to me he has been odd man out in recent years – been going his own way. Marilyn, high five on red, turquoise and bright green. LOVE. Katerina, we have to find our calm in the fashion chaos. And you have. Kim M, I like your waistband alteration strategy. Let us know how you acid wash your jeans. The Cat, sounds like a plan. bonnie, thanks for the compliment, and you wear those trends well. Dana, LOVE the ’80s, and which dress was that? The citron dress with the toffee trench and white shoes? Taylor, you have a very focused and fabulous wardrobe. I’m sure you’ll find exactly what you want picking through the trends. Suz, thanks for the sweet words. HGH FIVE to all the trends you’ve already chosen. I’m going to get bias cuts another go too. Firecracker, I’ve had 27 years of practice! The more you watch and observe, the easier it is to formulate opinions and pick out the themes. I’m liking the sound of your new uniform. April, there you go. Sorted. Laura, HIGH FIVE to the trends you like too. It will all filter down to retail, but some of the looks will be very fringe. The big question is: what has retail chosen to be mainstream? Rachy, I’m thinking a bright green boiler suit for you. You’re talking about Spring 2019 and not Spring 2018 as mentioned in your first sentence, right? As I read on, I felt comfortable with your anchoring comment to “Take the PERSONAL in personal style to heart because you have the power to pick and choose…” and I’ll focus on having fun with my signature style. Then, as I started reading about the trend, it got harder and harder to see where I could go with all of this. Light began to emerge as I started to see a few trends that may work for me. The ’90s Redux seems interesting as do the shades of beige (I’m thinking of my lightweight rosy beige gilet) and also my jumpsuit and jumpsuit dress. I’m happy to see that every style of shoe was covered on the runway. As for dresses, I have a couple of new short-sleeve print dresses that come to my knee at a feminine length and in my head of imagination, one may be able to simulate a midi look that I can wear with sneakers or my new block heel city sandals. So, I’m welcoming Spring and Summer and appreciate your take on all of it. Good to know lug soles won’t disappear as I need them for my fussy feet and to give me better proportions. I love the texture my new acid wash jeans provide! I need to keep in mind that quite a bit of eye candy is for my imaginary life and/or imaginary climate, especially since I seem to run colder with each passing year. Can’t wait to see the first collections hanging in the stores. I think the spring collections are always the most beautiful ones. And summer shoes! I’m through with boots and socks! Thanks for sharing!! Great summary. I think it is wonderful to be able to wear our own styles and pick from the melting pot. I see myself wearing midi lengths, cropped and full length wide leg pants, warm earthy colours mixed in with cooler colours, my version of camel and no doubt a few sporty touches. I don’t see myself digging deeply into the 90s, acid wash or very light denim and the bright suiting. But who knows!! Low heel footwear – sooo glad there continues to be so many options in retail. And lastly, lighter wash denim seems fresh to me. I will be looking for a higher rise, straight leg, light wash pair and hopefully a new WHITE pair of denim. Hehe! Don’t give me ideas Angie! Vicki, you are dead right. They are the 2019 shows and I changed the typo. Sounds like you'll be navigating your way around the trends just fine. Donna F, finally someone who wears acid wash too. Wooohooo. Nancy, Spring collections are in full swing! Sal, and you'll rock those trends. mtsnofthemoon, for the great reasons you mention, we are lucky to live in our current fashion era. Thank you so much for doing the work of identifying and labeling trends from the huge amount of choices out there! Beige is not friendly to my coloring,so I’ll admire that trend on others. I’m very happy that midis are staying around for another season and would like to add more skirts and dresses in this length. Patterns with birds and insects sound like fun to me, and I’ll stock up on more flat or low-heeled footwear. Thanks Angie. It’s great that there is so much to choose from. Yay for diversity. The skinnies era was quite rigid and uniform-ish. And I loved your comment about runway shows being dated because of the lack of diversity in models. Thank you for all your hard work Angie! I loved reading through this. I can see lots that I love and that I already have in my wardrobe. I will be embracing high rise wide legged cropped jeans and pants and earth tones. Beige is my friend as long as it is a warm one. Cropped jackets sound perfect for my style. And if burnt orange is around I will grab it. One of my favourite colours. Angie, thank you for controlling the chaos and shifting through the mosh mash. I much prefer your cleaned up and well articulated interpretation of the trends. I am really happy that individualism and personal style are on trend. I am in th process of reviewing and refining my work style, to a more casual, but still polished look. I am finding my current authentic look, knowing that it won’t be too long before I evolve again. I am most excited about the colors: turquoise, shades of orange, mustard, toffee and cinnamon. I envision some lovely combos of turquoise, toffee, white and orange. Ooh, I like the idea of statement denim! I am happy about the higher rises and am willing to try the wider legs. Back in the day, when I had a skinny little waist, I wore them well. We will see how I like them with the mor mature, wider waisted me. Yay!!! I was wondering when this list would come out. I haven’t been paying as much attention as I have in past seasons. I really hope a good chunk of it trickles down to retail. For myself I think I want less masculine. I do want some cropped tops. I’m eyeing more jumpsuits. And patterns. Oh wow, that’s a lot of information. Thanks, Angie! I’m excited to see earth tones and will be thrilled if they’re available in pretty things, not just utility. I’m also thrilled to see tailoring feature…oversized tops with no waist definition has been quite the challenge for me. Looks like there are going to be lots of lovely choices. Red and turquoise and midis and maxis. Yay! Well, beige would probably bookend my hair and play well with white (as an alternative to my beloved pale grey). I like the idea of Utility – does Out of Africa safari style count here? I just love everything about #3 above. On board for shorts and it will be fun to try some new silhouettes. Thank you Angie, you are such a wealth of information! What a skill to be able to take all that info in, and distill it down for the rest of us. I love these reports – and also the message to take what will work for us as individuals. Hey Angie, the “dressmaker details” I referred to from “old” Kate Spade are things like the use of ribbon, braid, or ruffles as decorative trim. Such as braid trimmed Chanel inspired jackets, sweaters with ribbon ties, or ruffles on the pocket of a tailored item, or as trim. Whoa, I’m exhausted just reading it all (thanx for all the work Angie! :-)) Individualism, creativity, drama without compromising comfort, personal maximalism and some unexpected juxtapositions continue to inspire me. Love turquoise (hope to find some), the midi lengths (as at my age, and body shape they flatter me the most-even if flattering silhouettes are not the thing:-)), the crop pants(including the wide hems) and the new block heeled(low) and flat footwear (especially with some geometric integrity). Here’s to another fun new fashion season! WOW….great recap….sounds like this season has a whole lot going on…and i’m exciting about alot of it…actually in reviewing the list, i’m pretty much on board with everything expect the color palette….. Although I continue to wear mine (more out of laziness/ease of wearing with boots on snowy days), I will be happy to see the demise of the skinny jean. I am SO bored with the look. Part of me is sorry to see Athleisure go, though, as it’s a look I like to wear on weekends. I am also sad that we’re not seeing more diversity represented in fashion shows. Wake up, designers! It’s going to be another fabulous style season, yay! I’m especially excited about the patterns, high rises, midis, fun suits, full-length pants, turquoise and bright green, and the great footwear options and the fact that we can make interpret all these trends in our own personal way. I’m sure I can find something here, but the chaos is coming through loud and clear! At first glance, I’m glad for earth tones, high rises, cropped wide legs, and juxtaposition. I can live with beige and pattern. Never say never, but you probably won’t be seeing me in acid wash or turquoise anytime soon. Sorry for the late comment, but WOW that is a lot of work you did sorting through all of this. It is pretty overwhelming, like everything vomited. The fresh green looks really good though.